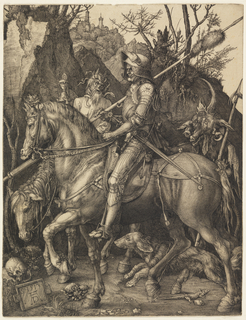 A knight in armor, and bearing arms, rides horseback, facing left, in profile. Death rides beside him, showing him an hourglass. A devil follows, his claws extended toward the knight. Rocky landscape in background. A dog and a lizard in foreground. At lower left, monogram of Dürer, and date of 1513 on tablet resting against a stone on which a skull is placed.